As some common holidays destinations like France and Turkey deal with the threat of terrorism, the number of tourists in Portugal increases. While this country remains a good choice regarding safety, the government has also worked on improving security measures. Bloomberg points out that Portugal, along with its neighboring country Spain, is already registering a growth in the number of tourists who are seeking sunny destinations. It comes in the aftermath of multiple terrorist attacks in France and the failed coup d’etat in Turkey, a nation now facing internal conflicts in addition to the already existing terrorism threat. 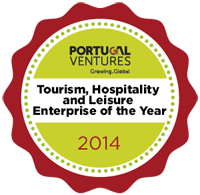 Tourism represents about 10% of Portugal GDP. In 2015, hotels registered over 16 million guests and 70% of those were foreign. The number of British and German visitors increased the most. Algarve, Lisbon and Madeira were the most sought-after regions. Bloomberg quotes the Portuguese minister of Economy, Miguel Macedo Cabral, who says that the country is working to promote different segments to attract more tourists, not only during summer, but year-round. The government is also looking to expand tourism to other places in the country. Portugal ranks 5th in the 2016 Global Peace Index by the Institute for Economics and Peace, climbing 6 positions compared to the previous year. Yet, in the light of the terrorism events in Europe, the government has also invested in improving measures in airports and common tourist destinations. However, this is not the only index where Portugal gets an honorable place. It is the 12th out of 207 countries in the KOF Index of Globalization for 2016. The Portuguese health care system ranked 12th in the world by the World Health Organization. In fact, Portugal has some of the highest rates when it comes to available hospital beds and number of physicians. You can learn more about Portugal and the Portuguese health care by visiting our site. Three Portuguese investigators were awarded 25,000 € to continue their research on Hereditary Diffuse Gastric Cancer. This collaboration is between two investigators from the University of Porto and from the Technical University of Lisbon. This is the first time that “No Stomach for Cancer” finances a project from an entirely Portuguese team leading the investigation in cancer genetics. Their work on the identification of the individuals who have mutations that might cause the hereditary diffuse gastric cancer caught the attention of this association. The goal of the association is to support scientific research about stomach cancer, especially those dedicated to early diagnosis and treatment. Gastric cancer is the fourth most common cause of cancer in the world and the hereditary diffuse gastric cancer is a genetic form of stomach cancer. Those who had cases in the family must do regular screenings to find out if they carry the genetic modification. There is not enough research yet about the genetic modifications and the manifestation of early stages of cancer that allows for a comprehensive identification of those at risk. The goal of the research is to offer an effective test for those who are genetically prone to have the disease and to better keep them under surveillance. CNN journalist Paul Ames highlights the beauty and undiscovered treasures of “Centro”. The centre region of Portugal for its monuments, natural beauty and of course, food. The article features main points of interest in the region. The sunny beaches of the Silver Coast – with the famous waves of Nazare where Garret Macnamara broke the world record for the highest surfed wave. The old luxurious palaces turned into charming boutique hotels at affordable prices. The cool cities of Coimbra and Aveiro and the Serra da Estrela Mountains – with snow in the winter and stunning views in the summer. And the witnesses of Portugal’s heritage like Alcobaca monastery or Tomar. Typical food from the centre region has its own itinerary. From locally produced cheese and wines, tourists can enjoy regional treats like goat, eel stew or roasted piglet and fresh fish in the many restaurants along the coast. Around the region there are many UNESCO heritage sites to visit. The Univsersity of Coimbra – dating to 1290 is one of the oldest in the world – with its buildings from renaissance and baroque periods. “Riyadh Travel Fair is the largest travel and tourism exhibition & congress attracting visitors and delegates from countries and regions that include Middle East, North Africa, Asia and Europe”, according to the organization. Visitants were very receptive to Medical Port’s offerings and were interested in knowing more about the several medical travel options available in Portugal. There was a high interest in diverse areas such as surgery or physiotherapy and there was also a great interest in the country itself. Portugal’s history and culture are still very associated with the Arabic presence from a few centuries back. The Arabic heritage is still present all around the country in monuments, food and even some Portuguese words are similar to Arabic. Medical Port wants the bond between Portugal and Saudi Arabia to be strengthened by bringing Saudi clients to Portugal to get to know the country and to be treated in world-class medical facilities, keeping their total privacy. 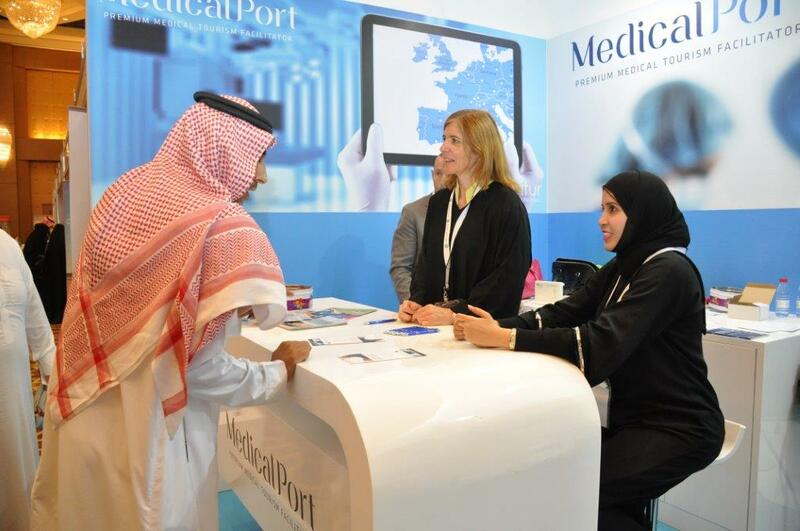 Medical Port’s presence at the fair had the goal to introduce to Arabic customers the offerings in medical travel in Portugal. The best private hospitals and clinics across the country have partnered with Medical Port to offer the best solutions in a wide range of medical treatments and procedures to those who would like to come to Portugal. These facilities are located in Lisbon – the capital – and Oporto, cities with international airports and daily flights to and from most European countries and other destinations across the world. See below some pictures of Medical Port’s booth at the fair. A new partnership between Medical Port and the Angolan airline company TAAG, was born this February. The healthcare card provides employees the access to medical treatments in Portugal and Brazil. 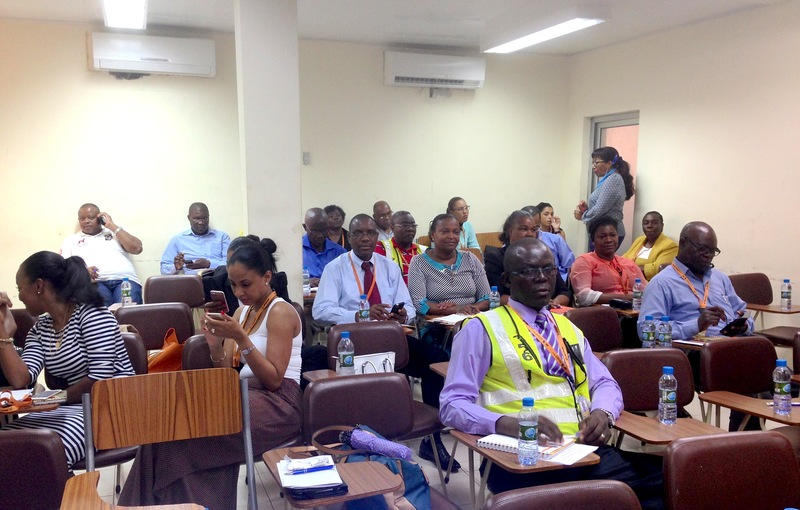 The corporate card called “Medical Port Empresas” launched at TAAG’s headquarters, in Luanda. Several employees who attended the event have before showed interest in health services abroad. The session opened with TAAG’s Human Resources Director.Then, Lusíadas Saúde head of Internal Medicine, Dra. Helena Cantante, talked about the importance of health prevention and gave several tips for a healthy lifestyle. Medical Port’s CEO, Belén de Vicente introduced the card and the advantages for TAAG employees. The medical services are provided by Medical Port’s partner network which includes groups Lusíadas Saúde and Amil (in Portugal and Brazil), Fisiogaspar and Oficina de Psicologia in Lisbon, and Clínica Espregueira Mendes in Oporto. Medical Port books exams, consultations, surgeries, and specific programs. Also, takes care of the travel arrangements for cardholders. Concierge and customer care services are available during the stay. Cardholders can request extra services like touristic or leisure activities in Portugal or Brazil. 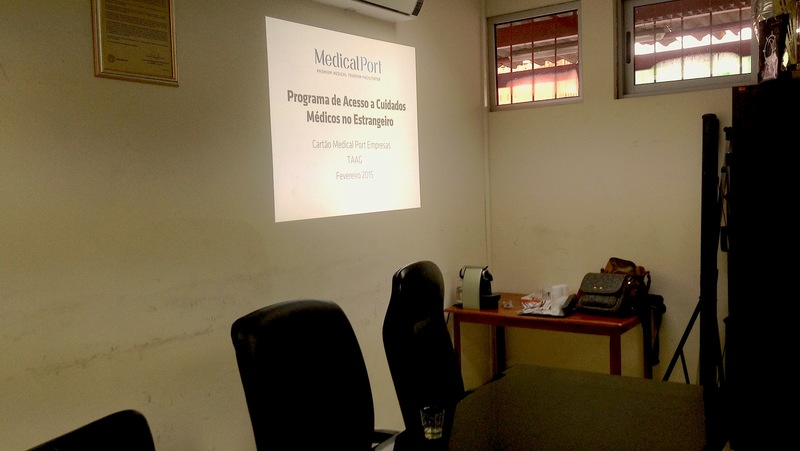 Other companies who would like to partner with Medical Port for top quality healthcare access both in Portugal and Brazil can contact us through the email info@medicalport.org or call +351 220 973 751. Last week, Belén de Vicente – Medical Port’s CEO – was the guest speaker of a Health Care Management course. The class main subject is international healthcare management with a focus on medical tourism. The class was held online and students were able to hear and see what the CEO had to say. The presentation took about one hour and questions and answers around half an hour. The goal of the lecture was to explain the concept of Medical Tourism and to describe the Medical Tourism Market in Portugal. The course Health Care Management Special Topics – International Experience is taught at Marymount University School of Business Administration in Arlington, Virginia. The course is about international healthcare systems with an in-depth approach of medical tourism industry. Students learn the motivating factors of the medical tourism trends and the impact of the medical tourism industry in the social, political, economical and cultural issues of the countries studied. Medical Port was chosen to talk about the medical tourism industry and how the company is leading the Portuguese market. Giving a global perspective and a look at the industry in the European Union and in Portugal. These are the main competitive advantages for Portugal that were highlighted: the proximity of Portugal from the United States, the ability of the Portuguese people to speak languages and the fact that 30% of the population is fluent in English, especially in the health and services sector, and the medical training of the Portuguese medical professionals. Students asked valuable and great questions about Medical Tourism in Portugal and they were highly interested in getting to know more about what the country has to offer to medical tourists, both in terms of cost savings but also in customer service. The cooperation between Medical Port and the class will continue, as students will be doing a group project focusing on: industry and market analysis on the possibility of penetrating the US medical tourism market. Teams will discuss the pros and cons of adopting a traditional marketing approach versus a modern marketing approach. And provide recommendations on which approach is more likely to attract US patients to travel abroad for medical care. Identifying the target population, the strategies to implement and the ones to avoid and make recommendations are the main goals of the final project in this course. 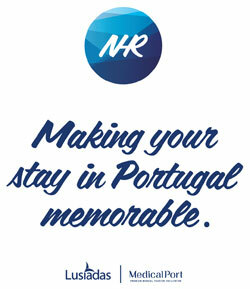 Medical Port launches a new product designed for Non-Habitual Residents in Portugal; the NHR Card. Medical Port launches a new product designed to offer Non-Habitual Residents an integrated solution to answer their needs whilst in Portugal; the NHR Card. Medical Port | Premium Medical Tourism Facilitator, in a joint effort with its partners, has launched a new product that gives its subscribers exclusive and immediate access to a set of services in the fiscal, healthcare, customer care and leisure areas with specially conceived benefits and offers to the cardholders. The NHR Card aims to simplify the holder’s life whilst in Portugal, by addressing some of his or hers major concerns, in an integrated way and with privileged conditions. For all the details and offers in the Fiscal Consultation Services, Medical Care, Welness, Leisure and General Support Services visit the dedicated area at medicalport.org/nhr. Portugal has created a special Non-Habitual Resident Regime (NHR) that offers attractive tax opportunities for foreign pensioners. Those granted with the NHR status can benefit from a special personal income tax regime for a ten-year period. This regime implies staying in Portugal for more than 183 days every calendar year and the NHR status has to be requested until March 31st of the year after you decide to take up residency in Portugal. 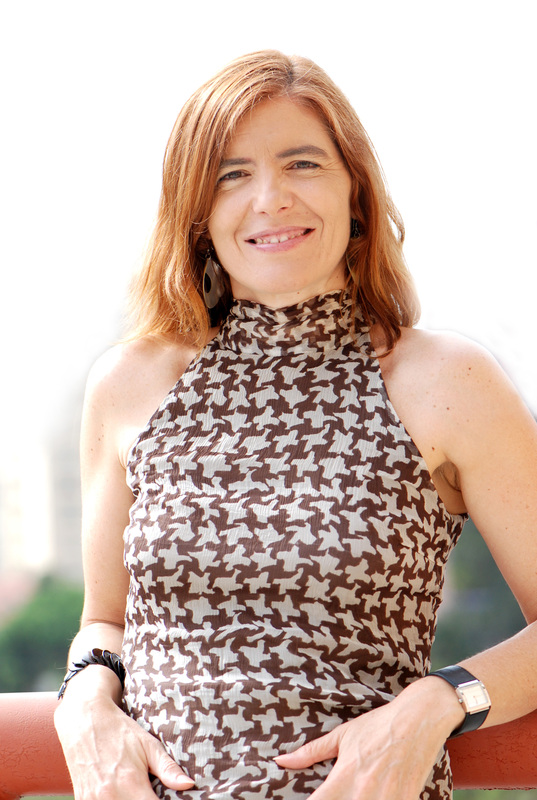 Belén de Vicente has recently given an interview to the Luso-American journal “O Jornal” that resulted in a wider article on Medical Tourism. In the interview Belén approached the extremely high healthcare costs in the USA, the services provided by Medical Port, its network of accredited hospitals and the purpose of the visit to the States. Belén de Vicente will be in Newark and Boston until the 23rd of May alongside Francisco Semião, Founding Director of the National Organization of Portuguese-Americans (NOPA). Those interested in contacting Belén or Francisco, can do so thru info@nopa-us.org or 703-389-3512. Belén de Vicente, Medical Port’s CEO, will be interviewed tomorrow, April 15th, at “Good Morning Kuwait” that airs at KTV1, part of Kuwait Television, Kuwait’s official state-run television station, and part of the Kuwaiti Ministry of information. Belén’s interview is part of a business development trip to the Middle East and will focus on presenting Medical Port to KTV1’s viewers, debating Medical Tourism and Portugal as a premium destination for medical travelers as well as Medical Port’s services and areas of expertise. For those that don’t have the opportunity to see the interview at KTV1, the channel can be viewed by streaming at its website here. Medical Port is the first truly Global Medical Tourism Facilitator dedicated to gather Portugal’s expertise in Medical Services as well as renowned hospitality for your benefit. Our goal as Premium Medical Tourism Facilitator is to provide you with adequate alternatives for surgeries and medical treatments in Portugal. Adequate meaning cost-effective, quality driven, according to your timings and customized to your needs. We make sure the entire process is quick, smooth and trouble-free. Medical Port ensures you a relaxing medical tourism experience abroad combining medical expertise from the top physicians in Portugal with great hospitality paying attention to the details that assure your well-being. With Medical Port you’ll have full access to the best medical staff in a safe and friendly environment that will boost your quick recovery. We will be your only point of contact during your Medical Tourism experience. We’ll listen to your needs, prepare your offer, put you in contact with the physician for the pre-assessment stage, provide you with your travel plan, enroll you at your Hospital of choice, book your favorite Hotel, a translator or chauffeur. We can even organize a dreamy cruise for you, a very nice way to celebrate your recovery. Whatever your needs or desires may be, we’ll make sure they’re attended to.